You may have noticed in the video that Bryce was carrying around some weird oddly glowing blue orb. It was the reason Caroline and I went to Ikea! 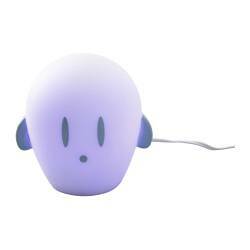 I'd been meaning to get Caroline a brighter nightlight for a while and knew that Ikea had some really neat ones. 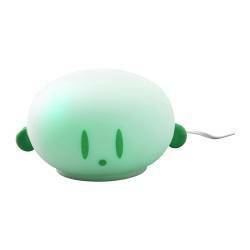 I thought for sure she'd pick out this really cute pink and green lamp type thing, but instead she picked out the SPÖKA. I thought it a little odd since she's been scared of the dark and these things are tiny bit spooky, but I guess the fact that they are bright colors and SHE picked them out makes them more fun than anything. She picked the green one for herself and the blue one for Bryce. I didn't realize it at the time, but they plug in to charge up and then they will glow for 4-6 hours! So very cool! Plus, they are really soft rubber and pretty durable given that they are in the children's department of Ikea. So I think they are a hit at our house. I'm amazed at the brightness of the glow too, but for a little kid, I'm sure it's not bad at all. I'm hoping these will help them in their sleeping in a new place while we're at the beach. I hope it was a good $15/each that I spent! I just love IKEA- their kids stuff is soooo cool!!!! THose lights look uber-fun! Great video, too- what a dancer she is! And I'll never get enough of seeing Bryce fall down- makes me laugh out loud! Maybe you shoulda named him Ford instead! I'm glad you explained it because I thought Bryce was smuggling uranium into the house, and we all know where that can lead. That's right, teenage smoking. OMG, we have exactly the same ones! I bought them about 3 months ago,and Maddie picked the green one for Sienna and the blue one for herself! Too funny. My kids love them!